Preprocess and analyze financial data. Convert date and time formats, including business day conventions, day count conventions, custom trading calendars, and coupon payment dates. Use timetable capabilities in MATLAB to remove entries with missing data and outliers and to resample, aggregate, and synchronize time-associated data. Compute technical indicators (including moving averages, momentums, oscillators, volume indicators, and rate of change) and create financial charts (including candlestick, open-high-low-close, and Bollinger band charts). Financial charts and technical indicators. Evaluate investment performance using built-in functions for calculating metrics such as Sharpe ratio, information ratio, tracking error, risk-adjusted return, sample lower partial moments, expected lower partial moments, maximum drawdown, and expected maximum drawdown. 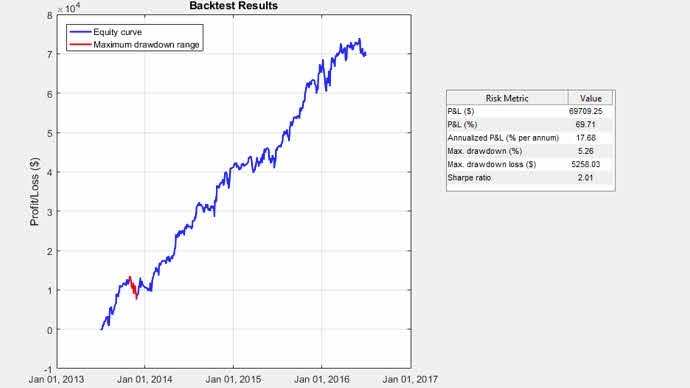 Equity curve from backtesting with performance metrics. Construct, optimize, and analyze portfolios with various objectives and constraints. 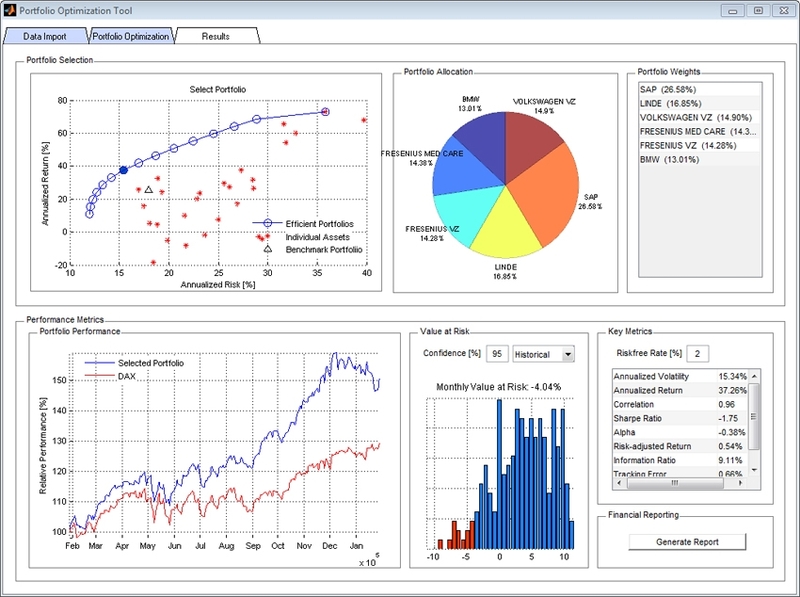 Use Financial Toolbox to perform mean-variance, mean absolute deviation (MAD), and conditional value at risk (CVaR) portfolio optimizations. 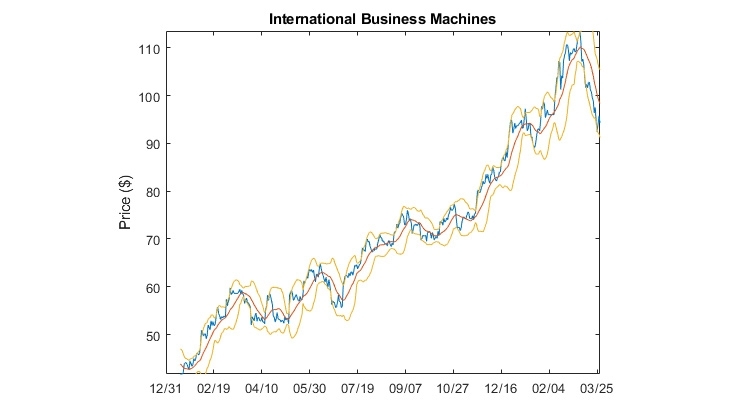 Portfolio optimization application built using MATLAB and Financial Toolbox. Estimate the efficient portfolio and its weights that maximize Sharpe ratio, visualize efficient frontiers, and calculate portfolio risks (including portfolio standard deviation, MAD, VaR, and CVaR). 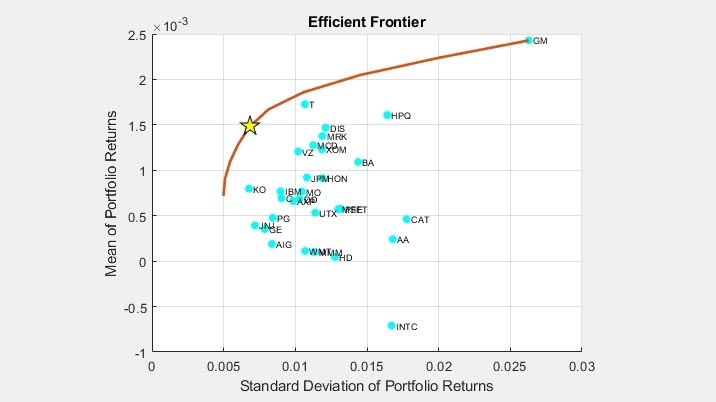 Efficient frontier and optimal portfolio. Apply portfolio optimization constraints, including tracking error, linear inequality, linear equality, bound, budget, group, group ratio, average turnover, one-way turnover, minimum number of assets, and maximum number of assets. Incorporate proportional or fixed transaction costs on either gross or net portfolio return optimization. 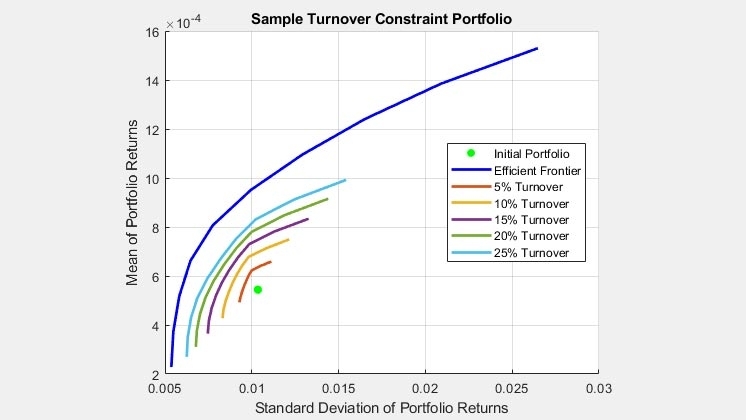 Efficient frontiers plot of portfolios at various turnover thresholds. Analyze cash flow, price basic fixed-income securities and European options, and perform Monte Carlo simulations. Use Financial Toolbox to calculate present and future values; determine nominal, effective, and modified internal rates of return; calculate amortization and depreciation; and determine the periodic interest rate paid on loans or annuities. Calculate price, yield-to-maturity, duration, and convexity of fixed-income securities. 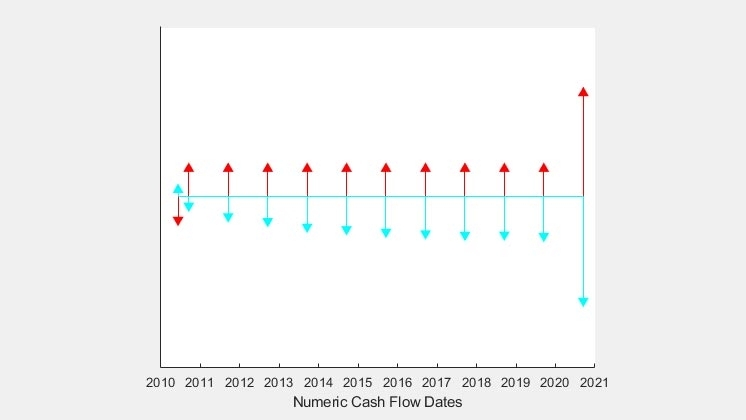 Compute analytics such as complete cash flow date, cash flow amounts, and time-to-cash-flow mapping for bonds. Calculate option prices and greeks using Black and Black-Scholes formulas. You can design, price, and hedge complex financial instruments with Financial Instruments Toolbox™. Gamma (z-axis height) and delta (color) for a portfolio of call options. 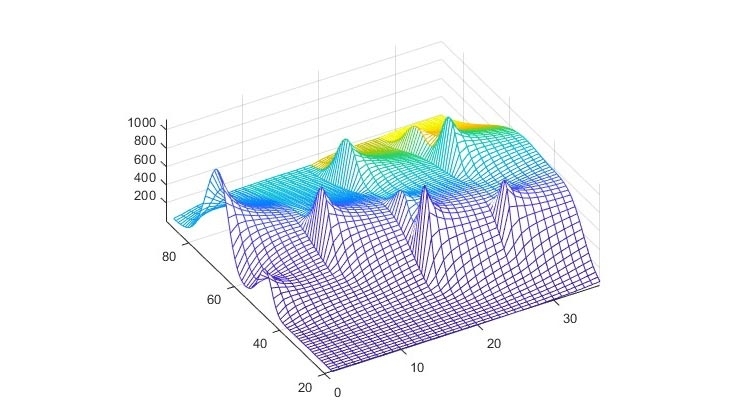 Generate random variables for Monte Carlo simulations based on a variety of stochastic differential equation (SDE) models, including Brownian Motion, Geometric Brownian Motion, Constant Elasticity of Variance, Cox-Ingersoll-Ross, Hull-White/Vasicek, and Heston. 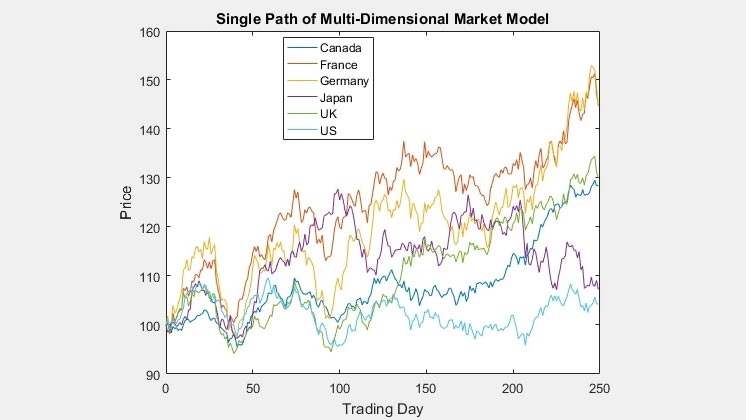 Single path of a multidimensional market model. Perform CVaR and MAD portfolio optimization with integrality constraints such as minimum and maximum number of assets.